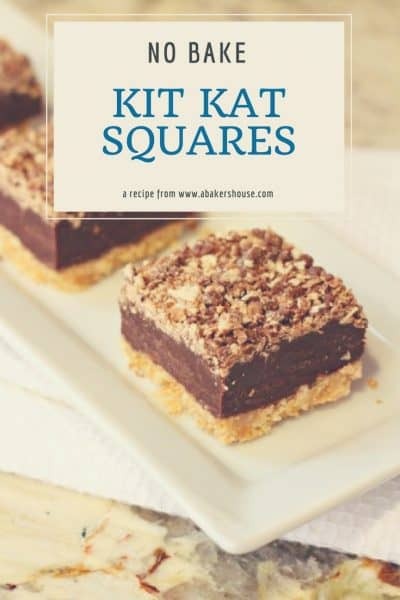 No Bake Kit Kat Squares are an easy recipe for a layered chocolate dessert that come together without baking. Kit Kats are a favorite or mine but you could easily try this with other candy bars too. The video shares a version made with an assortment of Halloween candy. 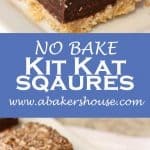 No bake Kit Kat Squares are the solution to summer baking. Summer heat is upon us and nothing makes a warm home hotter than turning on the oven. Since I can’t imagine a week in the kitchen without eating goodies, I was happy to learn that the theme for #CreativeCookieExchange in July was No-Bake Cookies. Hooray! 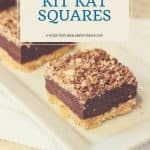 This kit kat bars recipe was perfect! 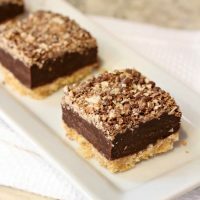 I found inspiration in these no-bake nutter butter butterfinger bars from The Domestic Rebel. I loved the idea of taking a candy bar and turning it into another type of treat all together. Kit kat bars are a favorite of mine– milk chocolate with layers of wafers– and that is the thought behind this kit kat bars recipe. Let’s walk through the steps to make Kit Kat Bars. These photos were updated in 2018 and I made a version with leftover Halloween candy. It’s fun to turn trick or treat goodies into a new dessert! Start by preparing your 8 by 8 pan and covering it with foil. Brush it with melted butter. 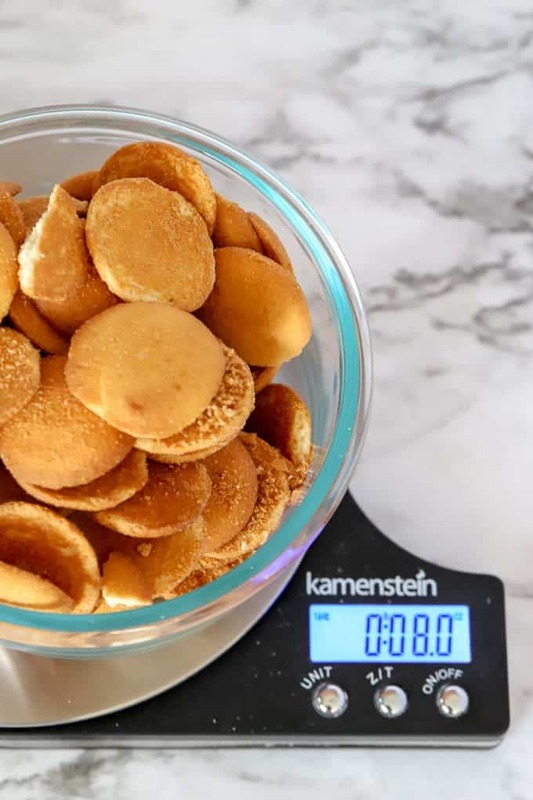 Measure 8 ounces of cookies for your crust. If you’d like this to be a gluten free recipe, select a gluten free cookie. Pulse the cookies in a food processor. Add the melted butter and pulse until combined. Press this mixture in the bottom of your pan. Move on to the chocolate. Combine the chocolate chips and sweetened condensed milk. Melt in the microwave then stir until smooth. Poor the chocolate mixture on top of the cookie crumb layer. Spread evenly. Move on to the candy. Use all Kit Kats or use a mixture of Halloween candy. Six ounces is about right. Pulse in the food processor. Spread the candy crumbs on top of the chocolate layer. Cover and place the bars int he refrigerator for 1-2 hours at least. Overnight is great too. Here’s how you make no bake kit kat squares: There is a wafer cookie crust on the bottom, layered next with a chocolate and condensed milk, and topped with a kit kat crumbs. No baking required— just the microwave and the refrigerator make these beauties! 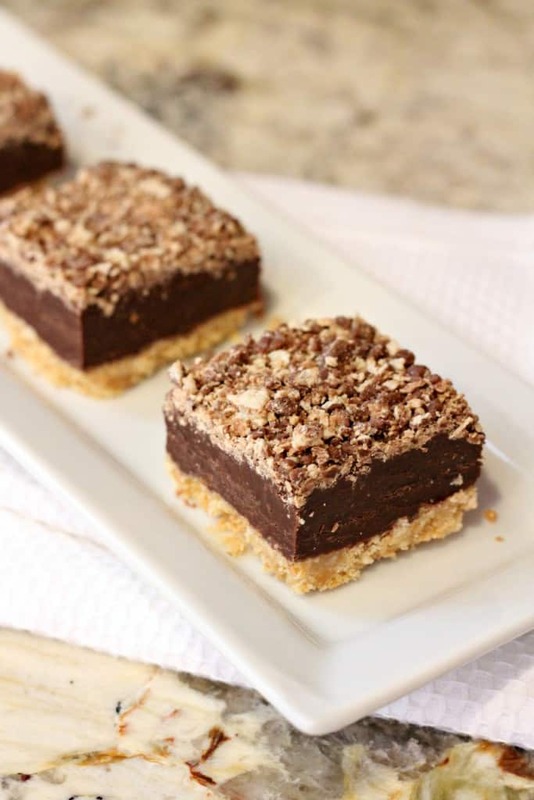 Enjoy this no bake dessert made with Kit Kat. Switch up the candy to your favorite! If you wish to make this gluten free, use gluten free cookies for the base and gluten free candy for your topping! 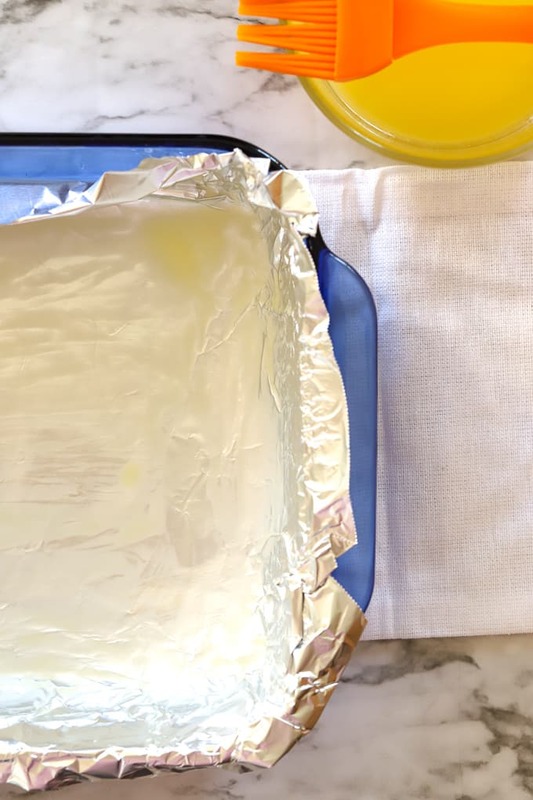 Line an 8 x 8 glass baking dish with foil so that the edges are overhanging. This extra foil will act as handles when the dessert is taken out of the pan. Brush with 1 tablespoon of butter. Pulse the cookies in the food processor until crumbs are formed then add the remaining 7 tablespoons melted butter and process until combined. Press the wafer crust firmly into the bottom of the pan. 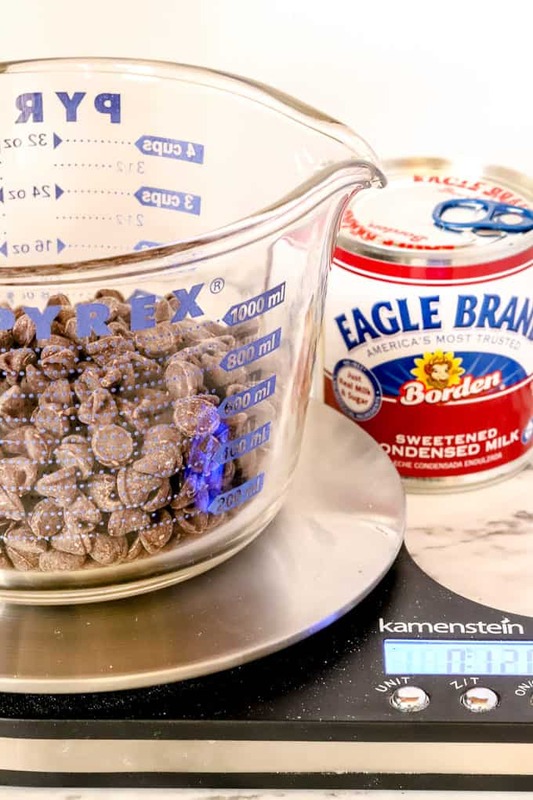 Pour the sweetened condensed milk and the chocolate chips into a glass bowl. Microwave for one minute, stir, then microwave for 30 seconds more. Stir again. The mixture should be smooth but if not, microwave in additional 15 second increments then stir each time. *Note: milk chocolate chips can be used for the most authentic kit kat chocolate flavor but I chose to use dark chocolate chips to add a different chocolate layer than the topping. You pick your favorite. You can't go wrong. Pour this chocolate layer on top of the wafer crust. 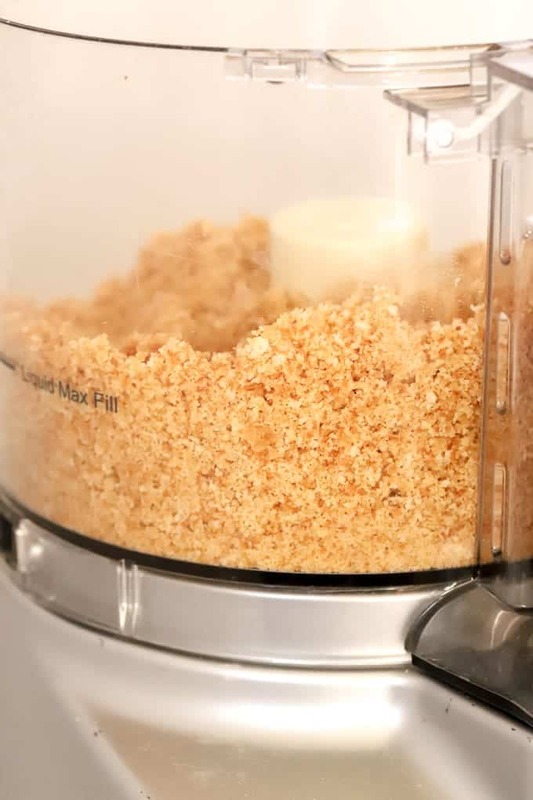 Next, pulse the kit kat bars in the food processor until the size of crumbs. Scatter on top of the chocolate layer then press lightly with a spatula. Cover with plastic wrap and refrigerate at least an hour or even overnight. 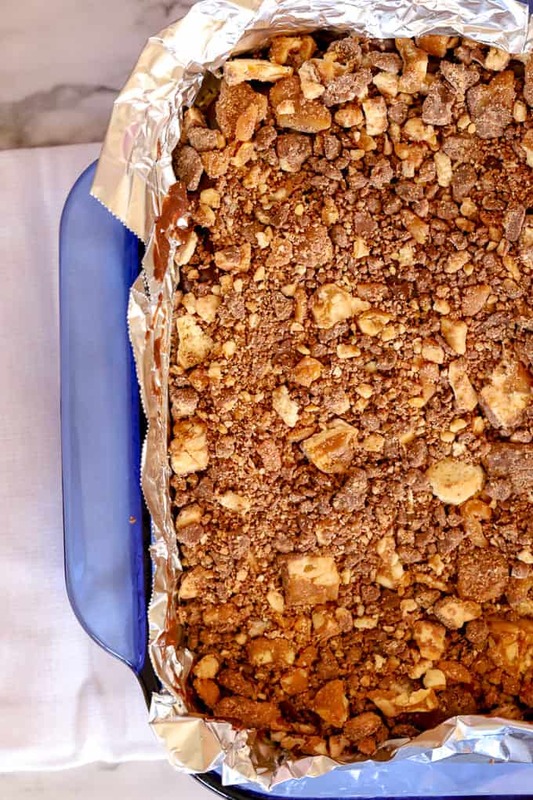 Try this recipe with other candy such as heath bars or chocolate covered toffee. Need a gluten free recipe? No problem! Use gluten free cookies and gluten free candies if you need to make this a gluten free recipe. 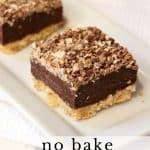 Join me there and save this no-bake dessert to your boards! Join us in this NO BAKE month! One of my favorite no bake dessert recipes is for mini no bake cheesecake bites. If you are a blogger, contact Laura via email ([email protected]) and she will get you added to our Facebook group where we coordinate events. You can also use us as a great resource for cookie recipes. Be sure to check out our Facebook page, our Pinterest Board, and our monthly posts. You will be able to find them the first Tuesday after the 15th of each month! 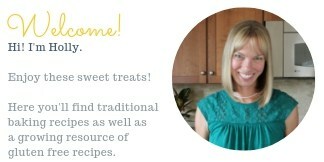 Thanks to Karen of Karen’s Kitchen Stories for organizing the links this month! This post was originally written in 2014 and updated in 2018. Kit Kat bars are one of my favorites too. I’m so glad you shared this recipe. Now I have a great excuse to get a big bag of them. 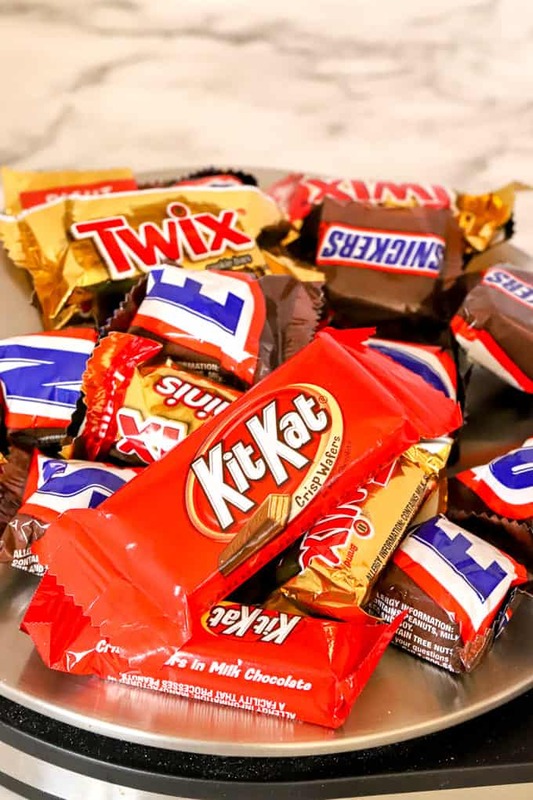 I need another bag of kit kats too– my son couldn’t believe how quickly they disappeared! Oooo, I love Kit Kats! Can’t wait to try this recipe. YUM! Those are lovely, Holly! And how great that you don’t even have to turn the stove on! Pinning these on my Recipes to Try board! Thanks, Stacy, it is hard to go wrong with chocolate plus candy bars!! These were fun treats to make and eat! I love Kit Kat bars, but don’t buy them because I would eat the whole bag. These are RICH!!! My husband would love all this chocolate. Yup, these are not low- calorie, that is for sure! Gotta love no bake cookies in this heat. These bars look delicious! These sound great, Holly! No bake is a great way to go anytime, but especially in the summer! I bet these disappeared very fast. I would hide them and keep them all for me! You are right– I did eat more than my share, just to “taste test” them of course! I made them with a friend in mind and managed to share at least half. I just HAD to test them first, right?? These are perfection, I can’t wait to try them!! Thanks, Tara! There are a lot of tasty treats to choose from this month with #CreativeCookieExchange! I think no-bake treats are great to make with kids, Yvette, so easy and everyone can get involved. Your cookies look so pretty, and all they sound easy to make. I wll book make these. Oh my these sound incredible! Love the look of these bars. Kit Kats are one of my favorites! My husband would LOVE these. Kit Kats are the only candy he likes, and he buys it to hand out for Halloween so he can have the leftovers! Gorgeous! No bake and candy bars. Yum! It can’t get any better than these and they are so pretty. I love it. uh oh, that condensed milk is a dangerously delicious thing! 🙂 These look really good Holly. Thanks for a “cool” idea. I have to agree with Lea Ann. Dangerously Delicious is how they look. I am hoping join the cookie exchange next month. Finger’s crossed. Oh, my family loves these candy bars. I can’t wait to make a batch! Kit Kat bars were never a candy bar that I could get into. But these bars, I could totally get into them! They look great, Holly. What size Kitkat bars ? Great question! Sorry I wasn’t clear in my recipe. I’ve updated it to read that 3 packages of the 1.5 oz kit kats should do the trick. There will be four fingers or pieces in each kit kat 1.5 oz package so 12 individual pieces. If you have the smaller package popular around Halloween just adjust accordingly and use about 10-12 fingers. When in doubt I always add a few extra! Love me some Kit Kats! I’m still confused about how many bars, here in Canada we get four bars (with four fingers) in a “pack”; I don’t know how many ounces that is. If I follow the number of packages on the instructions I will have 48 fingers but I see in the comments above 10 – 12 fingers. Hi Keri, Here is what I use here in the States– this 1.5 ounce bar has 4 segments (or fingers) to each package. I use three of these. Your packaging and sizes might be different.so just estimate. You won’t go wrong using a few extra! Can these be made a head of time and stored in the freezer? Hi Wendy, While I haven’t tried that myself, I think it sounds like a GREAT idea! I think they would freeze really well.Let me know how it works out! This recipe callsfor 8 tablespoons of butter,1tbsp on the bottom of the pan and 4 tbsps in the crumbs, what happened to the other 3 tbsps? When I cut my squares after being refrigerated for more than 6 hours the base crumbled and fell apart. There didn’t seem to be enough melted butter to hold the crumbs together. Not sure what went wrong. The filling is quite rich but I love the Kit Kat flavour. Oh no, Gloria, that doesn’t sound right. I am really sorry to hear that the bars didn’t stay together. Perhaps you could press the crust down more firmly next time? Or adding more butter might help too.